Teen mom, Jenelle Evans made it in the news again and your probably thinking what else is new, or what now did she do. According to The Clicker today Jenelle was engaged to her Marine ex Gary Head, but he broke off their engagement when he found out she and her ex Kiefer Delp secretly met up. Despite incriminating photos of Kieffer in what her ex-boyfriend, Gary, says is her bedroom, Teen Mom 2’s Jenelle Evans firmly denies they are back together. “I get off probation on Tuesday and I wouldn’t EVER think of jeopardizing that,” she said in an interview, referring to the fact that her probation restrictions forbid her to see Kieffer or any known drug user. However on Gary Heads official face book page, there seems to be a different story then what we are hearing clicker today website. According to his page, Gary says he is engaged. 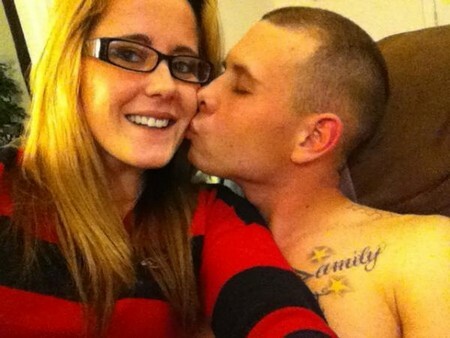 With no official date of when he got engaged, his display picture shows a smiling Jenelle getting smooched on the cheek by a shirtless Gary. Albums of the happy couple entitled “Jenelle Evans and I in love” with heart symbols date back to February 10th of this year and February 11th. However on Jenelle Evans official face book page seems to be singing a different tune. Strolling around and clicking around, I see a post she writes on April 21, 2012 from her mobile saying “I love being single. :]” So is she or isn’t she… you’re probably thinking. We can only hope for the best for this young mom in the sake of her son Jace.